Viren Murthy. 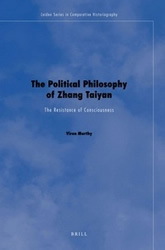 The Political Philosophy of Zhang Taiyan: The Resistance of Consciousness. Brill, 2011. Zhang Taiyan (1868-1936) is famous for being one of the first thinkers in China to promote revolution in the early twentieth century. Scholars have addressed Zhang’s revolutionary and nationalist thought, but until this work there has not been any sustained engagement with Zhang’s Buddhist writings which aimed to understand and criticize the world from the perspective of consciousness. These philosophical works are significant because they exemplify how, as Chinese intellectuals entered the global capitalist world, they constantly tried to find resources to create an alternative. As the author argues in the conclusion, this desire to create an alternative to capitalism remained throughout twentieth century China and continues today in the works of critical intellectuals such as Wang Hui. Thus this work is important not only to understand our past, but to hope for a better future.